The question of what living is for--of what one should care about and why--is the most important question a person can ask. Yet under the influence of the modern research ideal, our colleges and universities have expelled this question from their classrooms, judging it unfit for organized study. 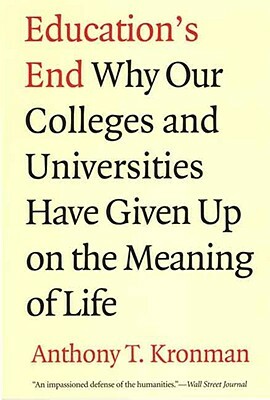 In this eloquent and carefully considered book, Tony Kronman explores why this has happened and calls for the restoration of life's most important question to an honored place in higher education. The author contrasts an earlier era in American education, when the question of the meaning of life was at the center of instruction, with our own times, when this question has been largely abandoned by college and university teachers. In particular, teachers of the humanities, who once felt a special responsibility to guide their students in exploring the question of what living is for, have lost confidence in their authority to do so. And they have lost sight of the question itself in the blinding fog of political correctness that has dominated their disciplines for the past forty years. Yet Kronman sees a readiness for change--a longing among teachers as well as students to engage questions of ultimate meaning. He urges a revival of the humanities' lost tradition of studying the meaning of life through the careful but critical reading of great works of literary and philosophical imagination. And he offers here the charter document of that revival.